Evo is a revolutionary colour overlay system that has evolved from the Bio Sculpture Gel system, based on the same industry-leading nail care technology. It is a fast-application Gel product in a 12 ml glass container. Evo applicators are soft rounded brushes, providing a neat cuticle finish and assisting in applying the correct amount of product during treatments. 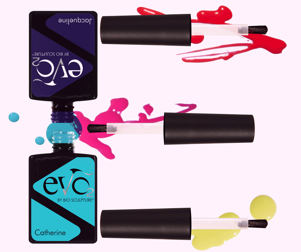 The Evo application method is simple and is applied much like Nail Polish. Will Evo replace Bio Sculpture Gel ? No. Evo by Bio Sculpture Gel is complementary to the original Leading Nail Care system. Evo will open doors to new opportunities for salons and spas to grow their client base by now also offering a quick and cost effective treatment. Evo is a colour overlay system and should be used in conjunction with Bio Sculpture Gel, which offers a tailored nail care solution for any nail type or condition with its extensive spectrum of Treatment Gels. Do I need formal training to become an Evo nail technician ? Not if you are already a qualified beauty or nail therapist. The Evo starter kit includes a user friendly manual showcasing Evo application, French application and removal demonstrations step by step. However, with Evo being Bio Sculpture’s fast lane colour overlay product line, Bio Sculpture Gel training is highly recommended in order to become a Professional Nail Technician. What is the difference between Bio Sculpture Gel and Evo ? Evo is a nail care system that has Evolved from the Bio Sculpture Gel system – Leaders In Healthy Nail Care. It is the ideal product to work with in a busy salon. Evo Base is Vitamin A and E infused, and these vitamins migrate to the natural nail after curing. Evo has a revolutionary Oxygenating Base, optimising oxygen and moisture vapour permeation to and from the nail plate. This permeation ensures no excessive dehydration or moisture build-up on the natural nail. Bio Sculpture Gel – Leader In Healthy Nail Care offers Sculpting, Strengthening, Building, Supporting and more nail care solutions as a custom nail care treatment system for any nail type or condition. Bio Sculpture Gel and Evo Oxygenating Gel complement each other and is completely compatible. Click here to learn more about Evo Oxygenating Gel. Does Evo need to be soaked off ? Yes. Evo Removal sachets make the process quick and easy without causing any damage to the nail plate. Evo is easily removed within 10 to 12 minutes. Evo Cleanser and Remover sachets are available in packs of 100. Are Evo colours the same as the Bio Sculpture colours ? Can you do nail art with Evo? Basic art like drawing French lines is easy to do with Evo. Evo has a special long, thin bristle Nail Art Brush that comes in its own black Evo bottle. Can I have a French Overlay on my nails using the Evo system ? Absolutely. Evo has a special slanted brush that makes French application easier. The slanted white French brush comes in its own black Evo bottle. Use the Evo Nail Art Brush to apply the French line on a shorter free edge. How long does an Evo treatment last ? Evo can last up to three weeks but this will depend on your client. To prevent unsightly regrowth, removal and re-application is recommended between week 2 and 3 – depending on nail growth rate. How long does it take to complete an Evo overlay ? Oxygenating Base layer, 2 Colour layers and a layer of either Gloss or Matt Top Coat. Can anyone have Evo done on their nails ? Yes. Evo can be applied to any nail type. If the client has long natural nails or any form of divergent nail type or condition, the technician can apply a layer of the appropriate Bio Sculpture Treatment Gel first before continuing with their Evo treatment.